Need to get flowers delivered in Dublin today? Spoil someone with a lavish floral display from some of Dublin’s most innovative florists, or send a beautiful bunch of roses to show that you care. Order your Dublin same day flowers online – it is super easy, and we’ll take care of the express delivery for you, getting your flowers to the recipient on the same day across the city, from Temple Bar to Trinity College. Whether you’re after deluxe bouquets or affordable hand-tied flowers, we’ve got the flowers that will make you the talk of the town.? Whether you need flowers delivered in Dublin city centre, or sent further out into the suburbs, we guarantee that your fresh flowers will get there unruffled and unspoilt on the day that you order them. We cover all Dublin post codes, from South Dublin to North Dublin - just order online by 11am to secure same-day delivery. Do you need a Dublin flower delivery on a different date? Not to worry – our calendar gives you the option to order your Bloom Magic flowers weeks in advance. What better way to honour our nation’s heritage and history than to send someone a vibrant floral bouquet from our popular Celtic collection? Or do you fancy crossing Ha’penny Bridge and escaping the Irish weather into a different world entirely and going for our sun-soaked Californian collection? We celebrate the best of local Dublin florists and feature unique floral arrangements you won’t find anywhere else. We source locally whenever possible, and use minimal packaging, ensuring that the floral gift you choose is as eco-friendly as it is eye-catching. Choose from our wide range of floral arrangements featuring captivating lilies and red roses. No matter what the occasion, Bloom Magic have just the right bouquet for you. Celebrate joyous occasions, like birthdays, anniversaries, and weddings with luxurious bouquets of fresh flowers that have been perfected for that very moment. 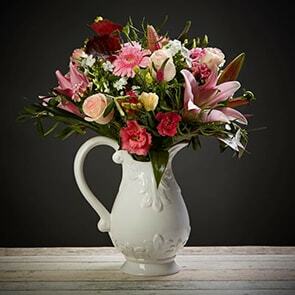 You can also send elegant same-day flowers to remind people that your thoughts are with them in their time of need, including sympathy & funeral flowers and get well arrangements. But you needn’t always wait for a special occasion to surprise your loved one with an enchanting bouquet – simply choose from our romantic flowers collection and our team of Dublin florists will begin creating a unique arrangement for you that conveys how you feel in flowers. To really treat someone, add a special gift for a more personalised touch – choose from our online gift collection and get them something special like a bottle of bubbly or a box of chocolates. 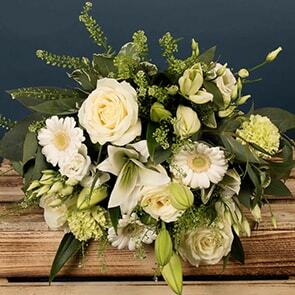 We offer same-day delivery on all our gorgeous floral bouquets across Dublin. With speedy delivery and great customer service, we strive to be the best online florist in the city. Our customer service team are on call 24/7 to help you choose the best bouquet. All our flower bouquets will last a minimum of seven days so that you can enjoy beautiful cut flowers for longer. Don’t forget to read our flower care guide for extra tips how to get the most out of your Bloom Magic bouquet.